Keith White’s background is in aquatic biology and environmental toxicology, and is currently a Senior Lecturer in Environmental Biology here at Manchester. He is applying this expertise to study water supply and security in Ancient Egypt. Keith’s particular interest is freshwater pollution and has worked on Manchester’s rivers for over 30 years. His work on understanding and dealing with pollution in the Manchester Ship Canal and Salford Quays was instrumental in the regeneration of the area, plus the formation of the highly successful environmental consultancy company APEM Ltd. He has had a longstanding interest in Egyptology and, for many years, was involved as co-supervisor and internal examiner of Professor Rosalie David’s master’s and PhD students in the KNH Centre. Keith aims to apply his previous expertise to the study of Egyptology. He is interested in water supply in ancient Egypt, in particular provision of water for drinking, food production and irrigation of elite and temple gardens. Water was sourced from the Nile and wells but often necessitated transport via water-carriers or donkey several kilometres to end-users in bulky ceramic containers. He is interested it the logistics of transporting water, and whether water provision restricted the size of urban centres and resulted in water scarcity. He is also interesting in reconstructing past water quality, including through the analysis of sediment cores. 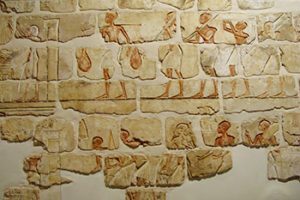 The focus of his research will be on Akhenaten’s city of Tel Al-Amarna which was constructed from scratch at very short notice and situated in a rather inhospitable area in Middle Egypt. Keith will also apply his expertise in trace element analysis previously used in the study of contamination to, for example, analysis of mummy resins and wall painting pigments.